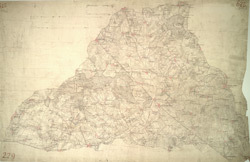 The county boundary of Buckinghamshire and Northamptonshire is depicted to the right of the sheet as a red pecked line. It can be seen following sections of the River Ouse. Two ancient forests are also shown: the Royal Forest of Whittlewood, a medieval hunting forest, is at middle left; and Salcey Forest, the heart of the ancient woodland belt of the East Midlands, is shown at top left. A section of the Watling Street is indicated from bottom left to top right. This ancient Roman road ran from London to Wroxeter in Wales, via St. Albans and Leicester (where it intersected the Fosse Way, the Roman road from Exeter to Lincoln).